It's been over three decades since an American woman has won the women's division of the Boston Marathon. On April 16, that all changed with Desiree Linden: the 34-year-old Olympic long-distance runner came in first with an unofficial time of 2:39:54. Lisa Larsen Weidenback was the last American woman to win the race in 1985. "I'm thrilled. I'm exhausted. I left it all out there," Linden told WBZ-TV. "It hurts right now, but it's a perfect day for me." Congratulations to the 2018 Winners of the Boston Marathon! 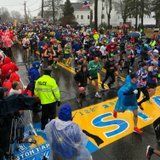 Cold rains and heavy winds are far from ideal marathon conditions , but the runners of the 2018 Boston Marathon persisted, and they all deserve serious praise. As the elite runners of Boston got their starts in Hopkinton, MA, trenching through the city for the 122nd annual race, emotions ran deep, but the winners ran faster.